The Samsung 55inch Curved Full HD Smart LED TV provides with stunningly immersive picture clarity. It sports a black finish and a sleek, vibrant design that goes well with your home decor. The curvature screen of this Samsung TV provides you with a balanced and uniform viewing from all areas of the screen. The Auto Depth Enhancer feature of the TV applies different levels of contrast enhancement to different areas on the screen and makes images come alive. 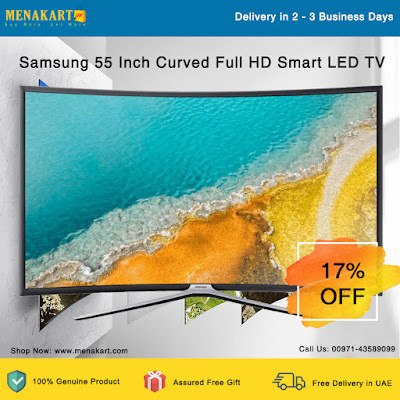 This variant Samsung Smart TV series offers enhanced performance and a glitch free interface, thanks to its proficient Quad Core processor and Tizen operating system. Switch between web browsing and media content and enjoy smoother multitasking. Just connect your USB portable media storage and access the content stored with the ConnectShare feature of the TV.